After over 10 yrs on Gili Air, Manta Dive Resort has grown to be one of the most popular Dive Resorts in the Gili Islands. Winner of the Trip Advisor 2015, 2016, 2017 & 2018 traveler's choice awards, we offer the perfect blend of excitement and relaxation for your holiday. 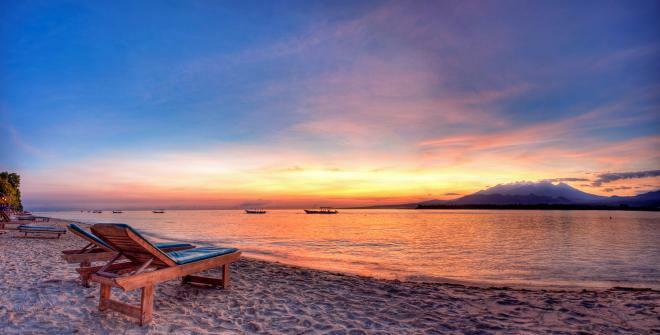 Manta Dive Resort Gili Air has grown to be one of the most popular Dive Resorts in the Gili Islands. 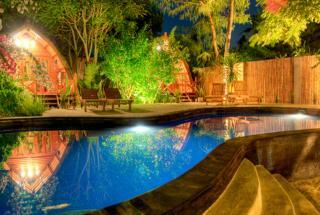 We also boast some of the best accommodation on Gili Air with different types of rooms available. You don't have to be a diver to stay with us, although you probably will be by the time you leave! Add to this great environment the expertise of our International Dive Team, we expect to be able to bring you everything you need. If you are not already a diver, Manta Dive Gili Air is the perfect place to learn. With crystal clear waters, one of the widest variety of marine species in the world, and our excellent instructors, you couldn't have a more relaxed atmosphere to learn. If you are already qualified, we have many options to go diving on Gili Air and further education courses to keep you engaged. But even if diving is not for you Gili Air has much to offer with our excellent new accommodation and other activities on & around the Island! 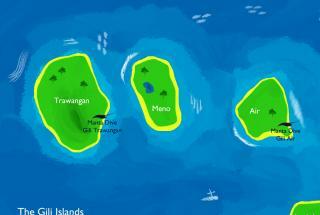 Manta Dive Gili Air is not just about diving. We offer a variety of accommodation options, the favourite being our Traditional Bungalows, as well as the slightly more spacious Garden Rooms, or the exclusive Deluxe Bungalows located next door to the Dive center. Manta Dive Gili Air offers the full range of PADI dive courses with their highly qualified instructors. Our instructors are carefully selected and boast loads of experience and knowledge of the local dive sites. 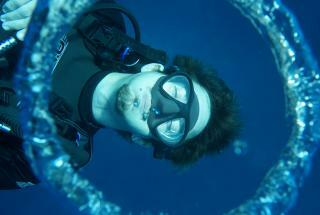 Get qualified or continue your diving education with us during your stay. Manta Dive is the only diamond rated SSI dive center in the region and boasts some of the best dive instructors & equipment the Gili's have to offer. Learn to dive with us in a fun and safe environment or continue your diving education to become an even better diver. Gili Air boasts a wide range of spectacular activities, mostly on the water. Aside from fun diving options around the Gili Islands that Manta Dive has to offer, there are many other unique experiences available on Gili Air. Go snorkeling, or soak up the equatorial sunshine on the pristine beaches. Try the local specialty food & drinks or relax beside the pools in our gardens. Located off the North West Coast of Lombok and just a short journey from Bali, the Gili 's are comprised of 3 enchanting Islands. Surrounded by crystal clear water, draped in Palm trees and blessed with beautiful white beaches, Gili Air is the perfect balance between quiet relaxation, great restaurants, accommodation options. All while offering stunning views of the ocean towards majestic Mt. Rinjani. Take the plunge and make your favorite hobby your new profession, with our professional diving courses! We offer professional level courses in a relaxed island environment. Let our experienced, multi-lingual SSI Dive Instructors take your training to the next level. Have a look at what lies in store for you at Manta Dive with our spacious facilities and well-serviced equipment. We love diving and exploring the underwater world, and hope to share this love with you during your time with us. Manta Dive Gili Air has been building assisting the Gili EcoTrust to build biorocks in front of our resort for the last 6 years. 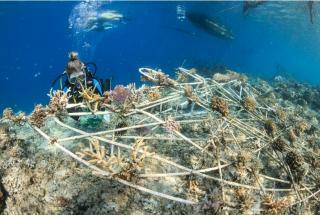 Each year we have added several structures to the coral garden we have been growing. Now we have over 14 structures, with many species of coral and fish life abundant on them!